CoffeeMongering | Coffee: It's more than just the caffeine! Coffee: It's more than just the caffeine! …his espresso tamper may very well be a Cavendish Series espresso tamp from Prima Coffee. The Cavendish Tamper series was inspired by the use of Mediterranean briar wood in the making of tobacco pipes. 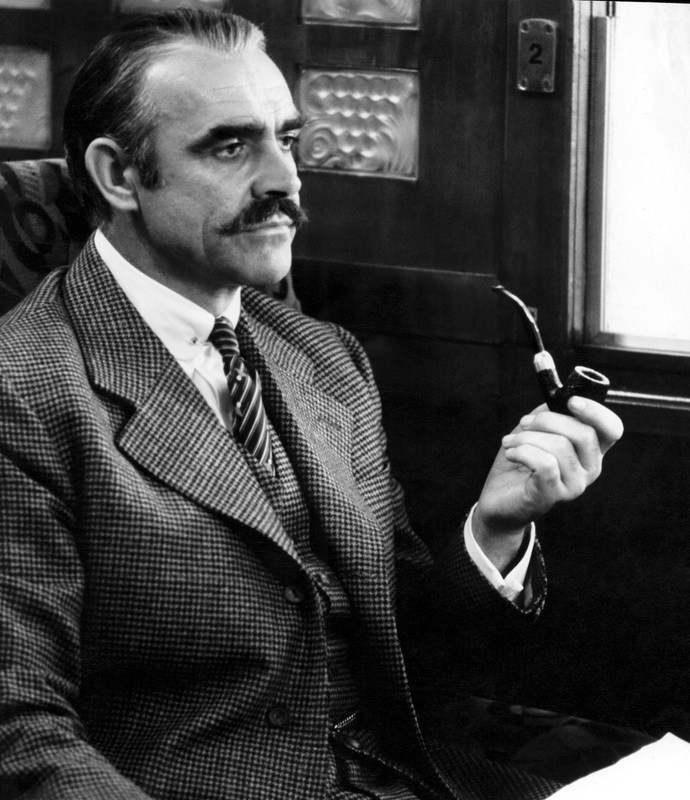 No matter how you feel about the use of tobacco or its health complications, there’s just something ineffably classy and charming about a pipe. It reminds us of time long past, when gentlemen smoked and discussed issues in the library. It reminds me of my great-grandfather, Mitchell, sitting in his creaky desk chair at the table by the window, watching the UNC football game on the television with the sound turned off. He chose instead to listen to the game announcer on the radio. While he listened to the game, he alternated between watching the game and poring over the local paper. Periodically, he would take up his pipe, tap the ashes from the bowl, and attempt to refill it with his favored Granger Select tobacco. I say attempt, because he had Parkinson’s disease, and typically got tiny fragments of fragrant cured tobacco all over the table, his shirt, the paper, and anything else within drifting room. He’d eventually get his pipe filled and lit, puff on it a few times, then set it down and promptly forget it until it had burned itself out. And the process would begin again. Not my great-grandfather. This is J.R.R. 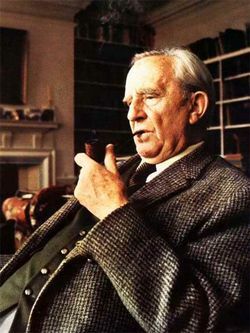 Tolkien, the guy that wrote Lord of the Rings. Sean Connery in his role as Col. Arbuthnot in "Murder on the Orient Express"
So, when I started thinking about what I would want my espresso tamp to be, I asked Lee Sill at Prima Coffee about what was possible for a custom sized tamper. I have large hands, and most of the tamps I’ve used never fit my hand or grip. I had very specific ideas about what I wanted, and Lee and I were able to come up with something I liked. You can watch the Prima Cavendish series handles as they’re made in this video here. 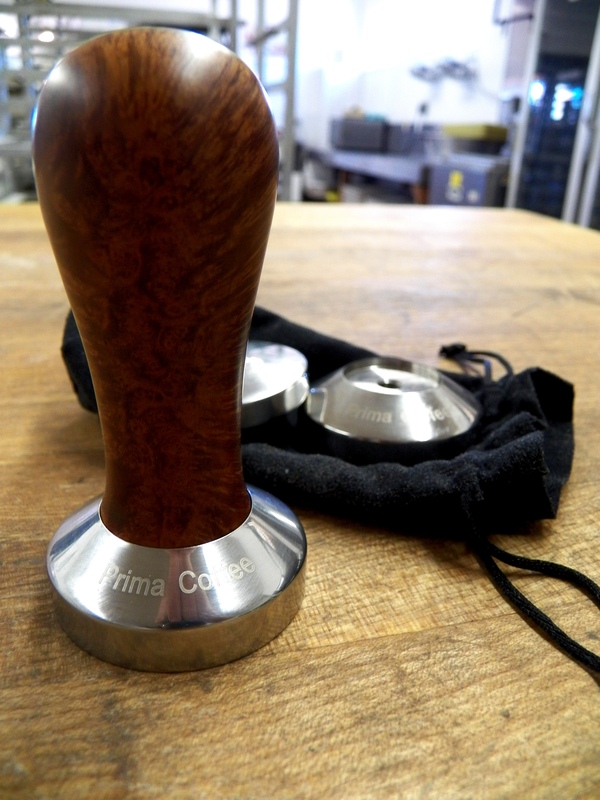 And this is the result…the Pear Alto Smooth Briar espresso tamper. I’m afraid I don’t understand the 100pt. scoring system many coffee bloggers use for their coffee reviews. (Not that it’s bad, simply that without understanding exactly the process at which those points are determined, I can’t relate to them.) I’m inclined to make this a little more user-friendly. After all, when I drink coffee, I don’t think numbers…I think how much I like or don’t like the coffee. Well, “Like” and “Don’t Like” is refreshingly simple, but perhaps TOO simplistic. So I propose I hit somewhere in the middle, something that can be quantified, but to which readers can more easily relate. I’ve decided to borrow a page out of the SCAA’s Sensory Score Sheet, so to speak, by using a scale ranging from 0 (Unacceptable) to 6 (Extraordinary). The full range will be: 0= Unacceptable, 1=Acceptable, 2= Average, 3= Good, 4= Very Good, 5= Excellent, 6= Extraordinary. There will also be a half-point option. For example, if a coffee is better than Very Good, but not quite Excellent, it could be scored a 4.5 or Very Good+. In the interest of full disclosure, my scoring will be as objective as possible, but it would be foolhardy to claim no subjectivity in these ratings. My scores will be based on what tastes good to me. It’s the only gauge I have. I don’t have a VST, so none of that technical jargon (although I’d love one!). I mean, most of us can only relate to these reviews based on what we like to taste, right? I’ll try not to let my penchant for Natural Processed coffee skew the whole thing, I promise. They’re the people that tend to blend into the periphery. Almost unseen, yet crucial to the accomplishment of the task. These talented, busy individuals do so much, most of it not visible to the untrained eye. This is my tribute. Fans of Frank Herbert’s “Dune” series….relax. Dave is not sporting the blue eyes typical of the Arrakeen spice addict, this is just about the only way you’ll see him during a regional barista competition, eyes eerily reflecting the blue of his trusty Dell sceen. 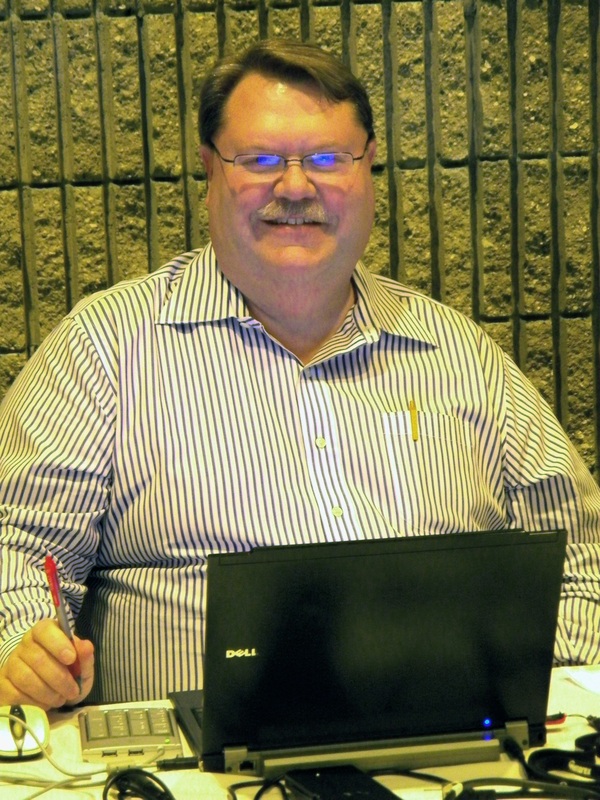 Dave sits behind this laptop all day, for each day of competition, tallying the judges’ results, and keeping vigil over the various appurtenances of the caffeine-imbibing judges. Most folks never see him, but without him, competition results would take WAY LONGER! Marcus Boni, is quite possibly the busiest person I have ever met. Multitasking experts should do a study of Marcus, just to learn what they’ve been doing wrong all these years. Marcus is the “James Brown” of the Barista Competitions, in that he is the “Busiest Man in Coffee Show Bizness”. None of these competitions could take place without his organizational skills and business acumen. How does he do it, you ask? Simple….KANGOO! Can you possibly imagine all the things that can go wrong at barista competitions? Me, either…but I bet Amber can. Amber rides herd on all the over-caffeinated volunteers who help with the little nitty-gritty details of barista competitions…like dishwashing, time-keeping, table-bussing, judge-fetching, schedule-keeping, etc. I’m convinced the list is MUCH longer than I realize! She’s kinda Marcus’ “Girl Friday”, catching the things that come up and dealing with them, or passing them on if necessary. Oh, and I think she’s the one that gets to decide if the barista presses a red, green, or gold star to start their presentation. Last, but never least, our head judges, not all of whom are pictured here. 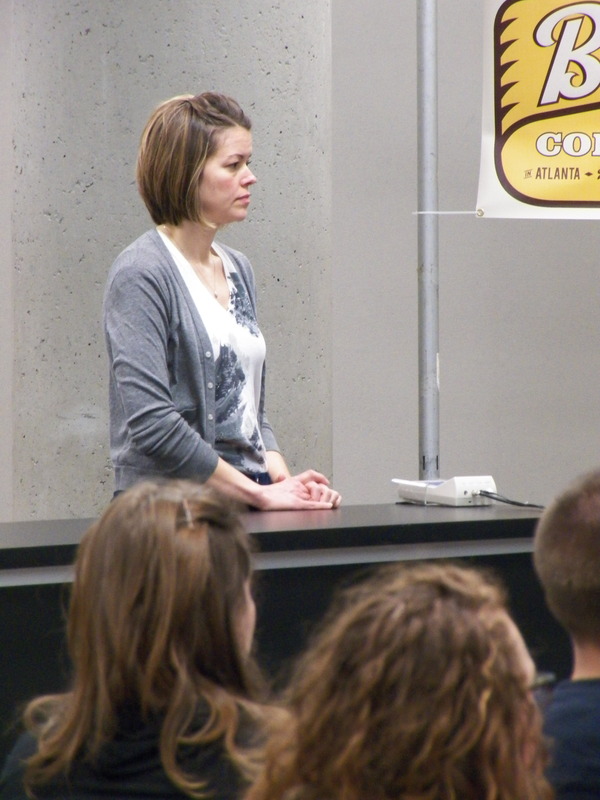 Heather Ringwood of Batdorf & Bronson Coffee Roasters also serves as a head judge. 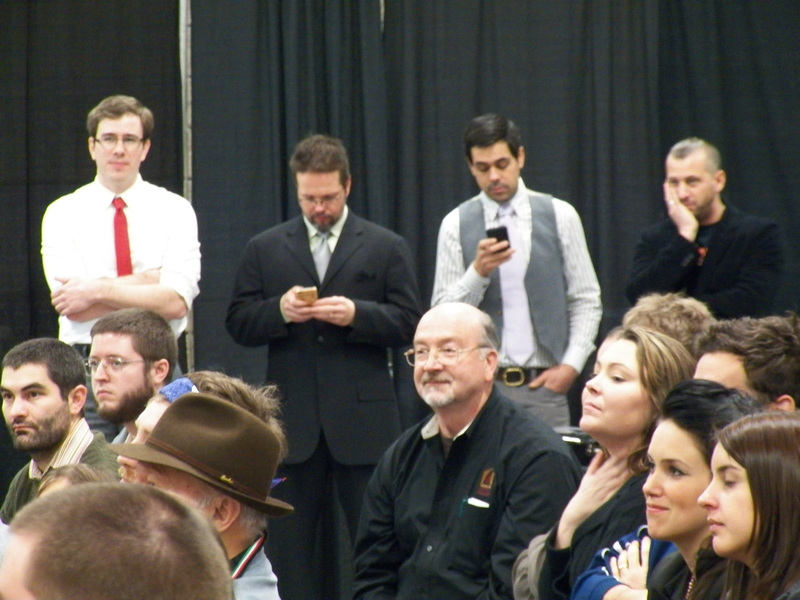 Now, please forgive the slightly fuzzy photo…I had to shoot it offhand from all the way across the competition venue. These fine people make sure the tech judges are seeing everything that happens during competition, and that the sensory judges are staying calibrated on competitors’ beverages. They are there for the barista’s benefit, providing continuity to ensure fair and equitable assessment of both the drinks served, as well as the service offered during the presentation. It has been my HONOR to work with these wonderful individuals, and I have learned so much about coffee from them. There are others, perhaps, of whom I did not get a picture. Alas, they were too effective about blending into the background! Nevertheless…if I missed mentioning someone, perhaps drop their name in the comments, so they get some recognition! Readers may be familiar with Williams-Sonoma, the upscale kitchen supply store you can find in many of the larger shopping malls across the country. 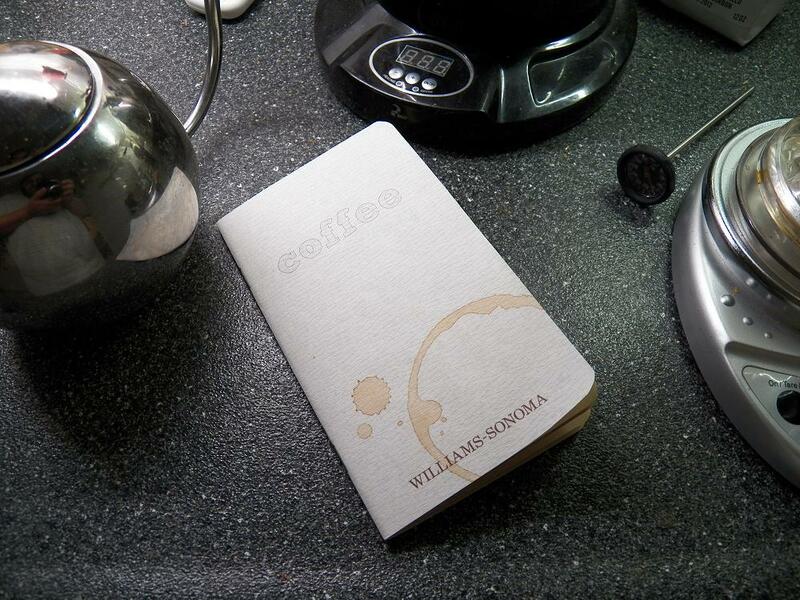 Recently, one of my co-workers brought me a coffee brewing guide book that was printed by Williams-Sonoma, featuring several manual brewing devices and the steps necessary to make good coffee with those devices. The coffee ring is not mine; it's artistically printed there. I’m really not sure how committed Williams-Sonoma is to proper coffee brewing, but my initial inspection of the information in this booklet indicated that they had at least done some research into coffee extraction. Featured in this book are several brewing devices, with step by step instructions on how to get a good cup of coffee. Williams-Sonoma sells these brewing devices in their stores, from brands such as Hario, Chemex, Bodum, etc. They even sell coffee, both ground and whole bean, from veteran roaster Illy, as well as 49th Parallel and even Equator Coffee and Teas. While I recommend both 49th Parallel and Equator, based on personal experience, my experience with Illy coffee won’t let me recommend it. 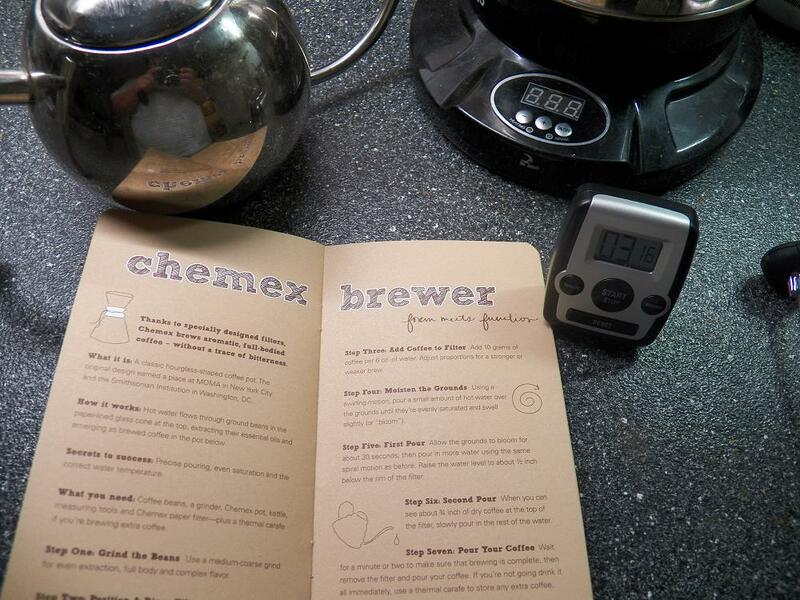 I was glad to see that Williams-Sonoma included the venerable and classic Chemex brewer in their list of devices. It’s one of my favorites, and even can be found among other design classics at MoMA, the Museum of Modern Art. Doubling as a decanter, the Chemex is an elegant brewing device. I’m not going to take pictures of all the pages and brewing devices, lest SOPA delete my blog completely from existence, and then go around with those red lights from Men in Black I & II, erasing our memories. But I will include this last one. I was a bit surprised to see it listed, knowing this isn’t the easiest brewing device to master. However, done correctly, it can result in a sparklingly clean cup of coffee, resplendent in floral and fruity tones. And it is a show! I love explaining the science behind this method! Meet Draw Coffee, as doodled by Ben Blake. I stumbled over Ben’s artwork while observing some online banter on Twitter with Mark Prince of Coffeegeek.com. Ben is a connoisseur of excellent coffee, and his brewing often inspires him to doodle. Now when I doodle, I get a bunch of squiggly lines, maybe some geometric shapes, maybe some goofy cartoon faces. When Ben doodles, he gets fantastic, almost impressionistic, renderings of his brew method, the coffee, the location, anything that catches his creative spark and fans it to flame. Does your Panama Elida inspire art? Go visit Draw Coffee for more fascinating doodles. 1 What if I could speak using legit barista terms or roaster-ese? If I did not love others, I would be nothing more than a hissing steam wand or a clacking doser espresso grinder. 2 What if I could predict coffee futures and understand all brewing methods and the entire extraction process? And what if I had a coffee podcast listened to by thousands of baristas? I would be nothing, unless I loved others. 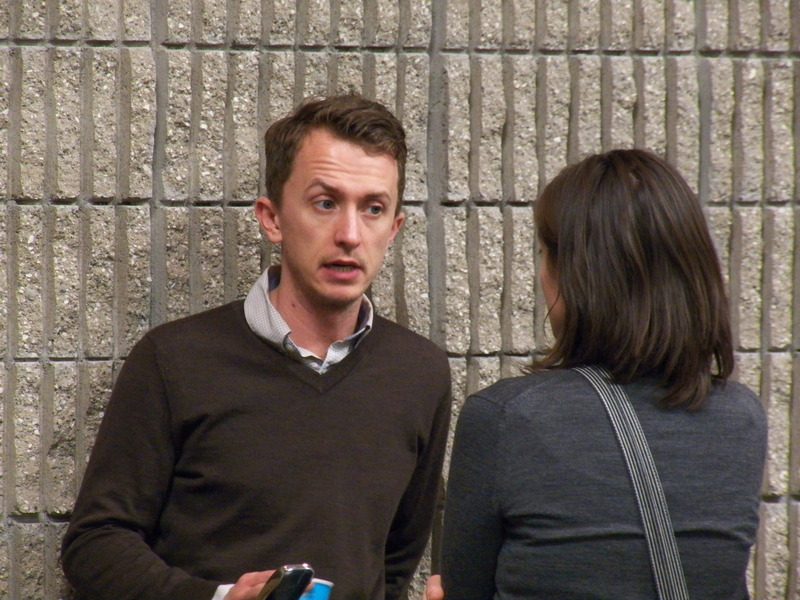 3 What if I quit my daytrader job so I could become a roaster and never over roast my ethically sourced green coffee? I would gain nothing, unless I loved others. 5 rude. Love isn’t selfish or quick tempered. It doesn’t keep a record the annoying customers that tick us off. 6 Love rejoices in the excellent customer service, not in the perfect cappuccino. 8 Love never fails! Industry icons will leave the coffee industry behind, and today’s coffee terminology will no longer be spoken. All that we know now may be forgotten and then rediscovered decades from now. 9 We don’t know everything, and our coffee brewing methods are not perfected. 10 The perfect cup of coffee we seek may never be tasted but we constantly strive for it. 11 When we were franchise baristas, we thought and reasoned as franchise owners told us to do. But when we grew up, we quit our franchising ways and pursued excellence. 12 Now all we can see of our industry is some good, and lots of bad. Later, as we look back, we’ll see more clearly. We don’t know everything, but we’ll understand more later because wisdom and experience will show us. 13 For now there are education, vision, and love. But of these three, the greatest is love. Wishing all my friends and coffee zealots a wonderful and successful new year! It’s not often that I’ve found cheeseball seasoning kits with directions on display in a coffee shop…actually, not ever, until today. But there it was…hanging on a display with a LOT of other expensive-looking packages of similar easy-fix-kits for the working stiff needing to impress the in-laws or the office staff with his or her party food skills. I decided to visit a new shop that had opened in the business district near my parents’ place, already with the mindset that I would be disappointed. After all, the name was “Common Grounds”…could there possibly be a more over-used name? To give some credit, this particular Common Grounds is located in a stand-alone repurposed bank building, surrounded by nice shrubbery and flower beds, with adequate parking and street access. The drive-thru teller’s lane had been reworked to accommodate the on-the-go coffee drinkers. I eased my way in through the back entrance, and found myself in a welcoming anteroom. I perused the always-expected community bulletin board, then crossed into the coffee shop proper. Some customers were placing their orders, clutching their handbags in French manicured hands, and chattering about their suburban Christmas get-togethers. The barista finished writing their drinks on their cups, and they stepped to the side. I noticed the espresso machine as I moved to the counter. Placed on the back counter, next to the drive-thru window, the Automatic Astoria had two hoppers on top, no portafilters, but seemed to have manual steam wands. The second barista was steaming milk in what looked like a 32oz pitcher, but might have been a 20oz. The young man running the cash register asked me for my order, but when I indicated my desire to examine their menu, cheerfully invited me to take my time, and began helping the other barista fill the previous order. The menu didn’t surprise me, nor did it fill me with joy. Every espresso drink involved a syrup or combination of syrups. A regular coffee was available from the airpot. Being familiar with a plethora of coffee shops, I knew better than to get the coffee, anticipating it to be hours old. Instead I re-examined the menu, looking for the best brewed coffee substitute, the Americano. No luck. I almost chickened out. I’ve become so accustomed to great coffee at home, and to exceptional espresso drinks from my favorite shops in Atlanta, Carrboro, Chapel Hill, etc, that every time I’ve tried a small espresso drink from one of these independent cafes with a huge inventory of flavor syrups, I’ve been disappointed. However, I felt I should give these folks a fair shake. Rather than order a typical mocha, my go-to drink in this kind of shop, I decided to order the Almond Joy. Yeah. Dark chocolate, coconut, and almond syrups, with espresso and milk. Before you coffee aficionados rush over to Twitter to unfollow me (or unfriend me on Facebook), remember from whence you’ve come. Once upon a time, espresso + syrup + steamed milk = specialty coffee, even to you. Even to me. Today, specialty coffee to some of us is a microlot of a seasonal coffee from a specific coffee farm in the country of our choice. Roasted by people who can explain in scientific terms what is happening inside the bean at any given moment during the roasting interval. Brewed in a device at the proper temperature for the appropriate period of time. By a barista in flannel shirt and skinny jeans with a beanie cap and ironic horn-rimmed glasses…ok, that last isn’t EXACTLY a requirement, but it seems to lend validity to the cutting-edge vibe some shops are shooting for. So what do YOU do when a cafe doesn’t line up with YOUR idea of what Specialty Coffee should be? This cafe was a pleasant shop, with a supportive local clientele whose only exposure to high-end coffee was the Starbucks at the mall, 40 miles away. The staff was nice, the decor appropriate, the other features useful (conference room, bookshelf, comfy chairs, high tables and chairs). The whole bean coffee did NOT have a roast date, and I DO draw a line there. I think if roasters want to be taken seriously in this industry, then a clearly stamped roast date is important. Now, put yourself in the barista’s shoes for a moment. You may have been there, once. What caused you to explore the more artisanal side of coffee for the first time? Seeing a picture of latte art? Trying a 5 oz. cappuccino with ONLY espresso and steamed milk…and liking it? The barista that waited on me complimented me on my hoodie, which says “Enjoy Black Coffee”, a design collaboration between Brian Jones (Dear Coffee, I Love You) and Simon Alander (Coffee Made Me Do It). This opened the door for me to chat with him about my rabid appreciation for high-quality coffee, the upcoming Thursday Night Throwdown at Cafe Helios in Raleigh, NC, and barista competitions on regional and national levels. After we chatted, I retreated to a table to sip my “Almond Joy” and browse my Twitter feed. I reflected on my experience, and discovered why this cafe, despite its plebeian attempts at coffee brewing, had gotten a favorable reaction from me. It was the barista. He was friendly, helpful, open, enthused, and willing to learn…on his own, if need be. I had a positive interaction with my customer service representative, and that clinched it for me. In other shops, I’ve had phenomenal coffee, brewed for me by a seemingly indifferent barista, and I left with that well-known “bad taste” in my mouth, and no intention to return. Another point to consider: when you highly-trained, extensively experienced uber-baristas come into contact with these fellow coffee pros that have NO IDEA what a portafilter is, try to keep in mind that, despite their lack of knowledge and training, they are professionals, and should be accorded some respect. Chances are they are wanting to learn more, though they may be intimidated by your smooth pronunciation of Kenya Gichathaini, and spotless vest and ascot ensemble. And you might extend that same courtesy to the home baristas that cross your path. All of us in coffee are constantly learning. If we do not, we stagnate. Let’s extend courtesy to each other, learn from each other, and find our own “Common Ground”. In years gone by, a person with the responsibility of selling a product was sometimes referred to as a "something"-monger. For example: a fishmonger was someone who sold fresh fish in the market. Often, the loudest hawker of a given item got the most attention initially, but it was the merchant who consistently offered the highest quality product who sold his wares early and went home. Coffee: It's not just about the caffeine.